The vehicle is equipped with either a 5-speed or 6-speed manual transaxle. The shift pattern for each is shown above. Depress the clutch pedal all the way down while shifting; then release it slowly. Your vehicle is equipped with a device to prevent shifting to R (reverse) by mistake. Push the shift lever downward and shift to R.
Do not use sudden engine braking on slippery road surfaces or at high speeds: Shifting down while driving on wet, snowy, or frozen roads, or while driving at high speeds causes sudden engine braking, which is dangerous. The sudden change in tyre speed could cause the tyres to skid. This could lead to loss of vehicle control and an accident. Be sure to leave the shift lever in 1 or R position and set the parking brake when leaving the vehicle unattended: Otherwise the vehicle could move and cause an accident. Keep your foot off the clutch pedal except when shifting gears. Also, do not use the clutch to hold the vehicle on an upgrade. Riding the clutch will cause needless clutch wear and damage. 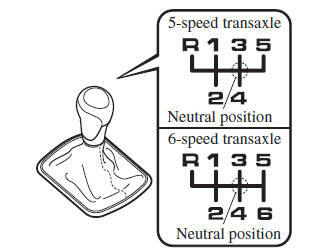 Do not apply any excessive lateral force to the shift lever when changing from 5th to 4th gear. This could lead to the accidental selection of 2nd gear, which can result in damage to the transaxle. Make sure the vehicle comes to a complete stop before shifting to R.
Shifting to R while the vehicle is still moving may damage the transaxle. For vehicles with type C instrument cluster*1 If the engine speed is about to exceed the permissible engine speed, the buzzer sounds. Refer to Over Rev. Buzzer on page 7-49 . To determine which instrument cluster is equipped on your Mazda, Refer to Meters and Gauges on page 4-24 . If shifting to R is diffi cult, shift back into neutral, release the clutch pedal, and try again. (With i-stop function) If the engine has stopped due to stalling, it can be restarted by depressing the clutch pedal within 3 seconds of the engine stopping. The gear shift indicator supports you to obtain optimum fuel economy and smooth driving. It displays the selected gear position in the instrument cluster as well as notifi es the driver to change to the most suitable gear position corresponding to the actual driving condition. Numeral The selected gear position is displayed. 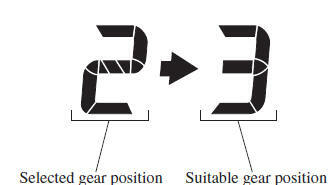 and numeral Shift up or down to the indicated gear position is recommended. Do not rely solely on the shift-up/ shift-down recommendations by indications. The actual driving situation might require shift operations different from indication. To avoid the risk of accidents, the road and traffi c conditions have to be judged correctly by the driver before shifting. The gear shift indicator turns off when the following operations are performed.